Follow this guide to unclog the commode safely and quickly so you can go on to more fun projects! Let’s face it: Dealing with a clogged toilet is about as much fun—but, unfortunately, just as necessary—as a root canal. 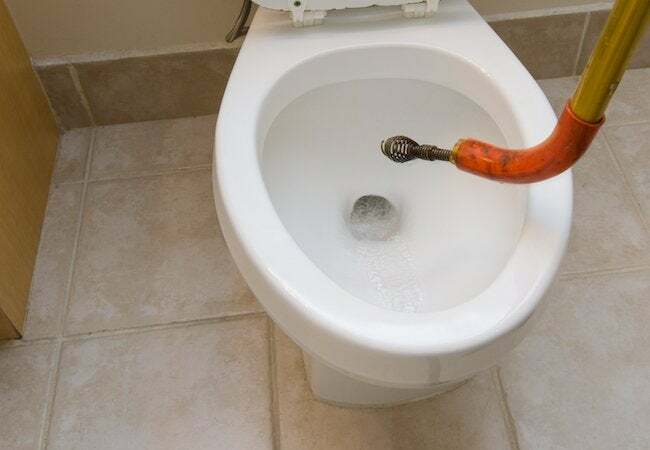 So if you’ve tried a plunger, a hot-water flush, or even a homemade baking soda solution and things still aren’t flowing like they should, it’s probably time summon the snake (also known as a plumber’s auger). That doesn’t necessarily mean calling a pro, however. You can rent a snake specifically made for the task at hand from your local hardware store for about $10 to $15 per day (far more affordable than even the most reasonable $50-an-hour plumber’s fee). This highly effective tool features a long metal cable with a coiled hook at the tip, perfect for dredging unwanted material from your commode. Simply follow the steps here to learn how to snake a toilet and simply flush the problem away. Put on your rubber gloves and place a large, empty bucket or waterproof container next to the toilet. Position the business end of the auger’s cable into the toilet bowl and aim it toward the drain in the back. Crank the handle clockwise to release and extend the cable down into the drain; keep turning the crank until it stops—you’ve reached the clog. Pull back slightly on the snake. If you feel resistance, it likely means you’ve hooked the source, so turn the crank in the opposite direction to bring the unwanted material back to the surface. Remove it from the bowl and dispose of it in the bucket. Repeat as necessary to make sure you’ve freed the clog entirely. Then retract the auger by cranking the handle counter-clockwise and place the wet end in the bucket. If you’re unable to pull out the clog out entirely, attempt to break it up enough so that it will flush down. Crank the cable as far as it will go, jiggle it lightly, retract, and repeat several times. Once you’re able to move it farther and more freely than you were when you started, you’ve breached the clog. Now, remove the auger and stick the business end in the bucket. 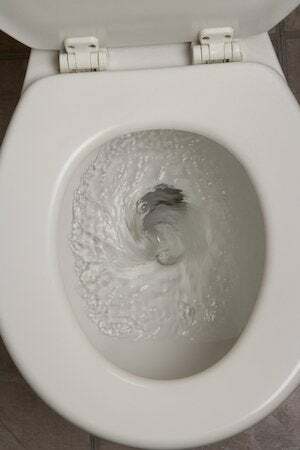 To avoid the possibility of overflow when you flush, remove the tank lid and manually stop the flapper from releasing too much water into the bowl. It’s a two-handed procedure: With your less-dominant hand, flush the toilet as usual and close the flapper—the 2- or 3-inch rubber disc attached to a chain inside your tank—with your dominant hand to prevent the bowl from filling up too high. Once you’re sure the clog is gone, flush again while leaving the flapper alone. To clean up, dump any waste collected in the bucket back into the toilet in small amounts and flush to make sure it all goes down without causing a new clog. Then, thoroughly clean the bucket and the auger with very hot water and bleach or vinegar before returning it to the store. You may be able to save yourself the trouble of a repeat performance by being careful about what you put in the commode. The safest approach is to flush toilet paper only. Sanitary products, paper towels, dental floss, and hair should never be flushed. If you have particularly old or sensitive pipes, consider switching to a lighter ply brand of toilet paper to help keep things moving along.